Cyprus has all the right ingredients to maintain a strong and resilient economy: a small country-community (low population), productive labour force, business friendly and flexible government (general policy of non-intervention in business operations), as well as excellent trade and geopolitical relations. 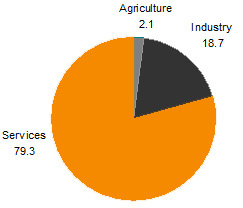 Services drive the Cypriot economy (almost 80% of total GDP), namely financial professional services and tourism, whilst local industry, manufacturing and agriculture is healthy and more or less self dependable and enough to facilitate domestic demand – rich local produce. Over the last two decades, Cyprus has made enormous steps in structural reform, modernisation and liberalising its market-oriented economy, with a view to enhancing international competitiveness and EU compatibility, especially in financial and professional services. Cyprus is also successfully meeting the challenge of being a member of the larger EU and Eurozone community, whilst strengthening ties further afield, such as with the USA, Canada, Australia and the Middle East, as well as with emerging nations China and India. This is firmly positioning Cyprus as a true global economic gateway. Financial and professional services will no doubt continue to play an integral role to the national economy and domestic well being. Granted, internal politics and the private sector will always endeavour to satisfy whatever is required to ensure its sustainability and growth, whilst meeting the needs of the international community. Recently, Cyprus has been in the world news due to its major restructuring process and banking issues following the financial slowdown in Europe and much of the developed world. International and European aid was also required here to support the economy. 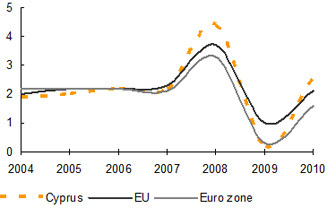 Indeed, Cyprus was severely exposed to external conditions, especially in Greece, and its own misuse. Its excellent economic indicators prior to the economic suffered. However, many changes are occurring – and have already changed – In the financial system, banking and the public sector. These will no doubt make the economy much more stable and sustainable for the long term, positioning Cyprus as a fully credible and secure investment hub. This is especially vital considering the country's reliance on professional and financial services. However, it also comes ahead of new emerging economic sectors, namely in energy hydrocarbons, which should provide the stimulus to boost economic growth far beyond it has ever experienced in the past. Cyprus has all the right ingredients to maintain a strong and resilient economy: a small (low population) country and hard-working community, productive, skilled and highly educated labour force, business friendly and flexible government (general policy of non-intervention in business operations), as well as excellent trade and geopolitical relations. Services drive the Cypriot economy (almost 80% of total GDP), namely financial professional services and tourism, whilst local industry, manufacturing and agriculture is healthy and more or less self dependable and enough to facilitate domestic demand – rich local produce. Over the last two decades, Cyprus has also made enormous steps in structural reform, modernisation and liberalising its market-oriented economy, with a view to enhancing international competitiveness and EU compatibility, especially in financial and professional services. Cyprus is also successfully meeting the challenge of being a member of the larger EU and Eurozone community, whilst strengthening ties further afield, such as with the USA, Canada, Australia and the Middle East, as well as with emerging nations China and India. This is firmly positioning Cyprus as a true global economic gateway. Foreign Direct Investment (FDI) levels are testament to Cyprus' attraction as a financial and professional services centre. 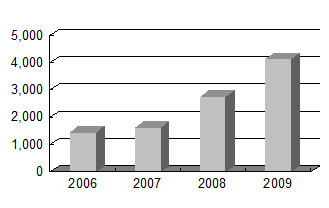 Since the beginning of the decade, FDI to Cyprus has been progressively increasing. 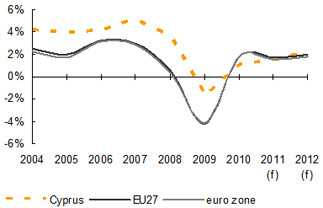 Even during the financial down in 2008 and 2009, FDI to Cyprus was benefiting. 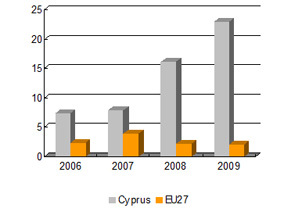 According to the Central Bank of Cyprus, inward FDI reached €3.6 billion in 2009, reflecting an increase of 200% compared to 2008 (€1.2 billion). This is partly due to the efforts of banking and financial institutions, as well as other major companies operating in Cyprus to strengthen their capital base in order to deal more effectively with the crisis. The level of foreign investment is even higher based on the revised FDI residency definition adopted by the Central Bank, which includes companies registered in Cyprus but without a physical presence on the island (brass plate companies). 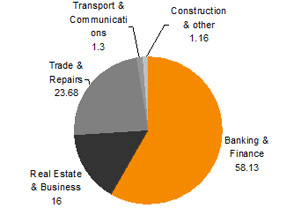 Based on the new definition, foreign investments reached €4.5 to €5 billion in 2009 compared to €2.7 billion in 2008. 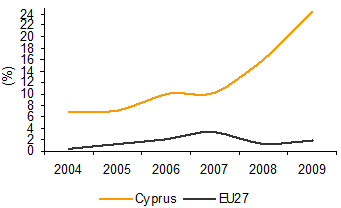 At present, Europe is by far the largest source of FDI to Cyprus, followed by the USA and then Asia. By country of origin, top feeders are the Russian Federation, the UK, Germany, USA, Greece, and the British Virgin Islands. Administrative procedures have been simplified and no limitations or restrictions apply in most economic sectors with respect to the maximum allowable participation percentage, as well as the minimum monetary level of investment. Bureaucratic intervention has been reduced, fostering investment opportunities for non-residents. In particular, foreign investors considering registering companies, acquiring shares of existing companies, or setting-up enterprises in Cyprus, no longer need approval from the Central Bank. Foreign investors now have the opportunity to invest and undertake activities in Cyprus on an equal, non-discriminatory basis as locals. Investors from other EU Member States are entitled to hold a participation of up to 100% in any enterprise in Cyprus. The government has also instituted far-reaching reforms to further strengthen the regulatory and business environment in the country. Since joining the EU, Cyprus has implemented significant economic and structural reforms which transformed the economic and business landscape of the country. Tariffs and quantitative restrictions have been eliminated for all manufactured goods and agricultural products originating in Cyprus and other EU countries, liberalising trade. Interest rates and price controls, as well as investment restrictions have been lifted and key public utility sectors such as electricity and telecommunications are now open to competition. Within the EU, the Common Customs Tariff (CCT) and all relevant EU legislative frameworks for the facilitation of the free movement of goods, capital and services have been adopted. In relation to the taxation regime, Cyprus offers a plethora of advantages to both individuals residing and companies conducting business on the island. Cyprus has the lowest corporate tax rate in the EU at 10%, and has concluded double tax treaties with over 50 countries worldwide, plus a further 40 currently in negotiation.